Every time I go to a move it's magic, no matter what the movie is about. Escape the sweltering summer heat by slipping into a cool, dark movie theater, snuggle down into the cushioned chair, feet propped up on the seatback in front of you and start tossing hot, buttery popcorn into your mouth one plump, salty piece after another. Or gather the family together in your own living room around a pizza in front of that favorite dvd, the perfect way to end a day of vacation, a day spent on the beach or hanging around the pool, snapping pictures of the sites or standing in line waiting to spend a steamy day at the zoo. Or remember the good old days of school holidays when all the kids would pile into the station wagon and dad would drive the gang to a drive-in movie? A classic! Ah, movies are so much a part of summer holidays! The latest blockbuster chock full of shoot outs, car chases and giant fire balls, a soppy summer romance, an animated film for the kids… summer is the best time to kick back and watch a movie. Oldies and goldies, chick flicks, sci fi or vampires, we all have our favorites, the perfect movie to forget the heat or just relax and lose ourselves in another world. So this month, come into the cool kitchen, turn up the air and pull out your egg whites and think of that great movie that takes you away, lets you become someone else, travel to somewhere else and just escape. Friends, this month’s Mac Attack challenges you to create that perfect macaron inspired by a movie: whether old or new, comedy or drama, black & white or in glorious Technicolor, let that movie inspire, fire up the ideas and pull you into an imaginary world of cameras, lights, costumes and scenery. You are the screenwriter, the director, the cast and crew… now to produce an award winning cinematographic macaron! * Thanks to Mardi of eat.live.travel.write for suggesting this month's theme! We are open for suggestions for future Mac Attack themes so feel free to e-mail Jamie or Deeba! Please have your Mac Attack post up no later than August 15 '10. Round up will be on August 20, 2010. Woo Hoo! Great theme! Looking forward to it! This one should be a little easier for me. I love it. So many to choose from. Hi I've popped my post up this morning. I had a bit of fun with this one. Couldn't help myself I posted another one.....This is such a fun challenge. I'm curious if I can do this on my vlog, because I do that instead of blogging. It isn't a baking vlog eiter. But I love baking and have had a recent obsession with macarons and want to try one of these ._. My post is up: This month we had success and failure on a number of levels and I tried a new technique! My post is up with a few days to spare. I'm really on the ball this month. Love this month's theme. Wahoo! Just posted mine after my little color mishap ! I love this group, everyone is so creative and talented ! My post's up. What's up Doc? macarons. This is my first post ever, I hope it's alright. I've never blogged before so it's not all that awesome. But I hope you like the picture. Eeps, I had my post up, but totally forgot to comment here. Please include me on the round-up! i am SO late! please accept my late late addition! Fun! I'll join up for next month's round. I've enjoyed making these for the last year but I'm STILL trying to perfect them. I would LOVE to see someone (hint!) 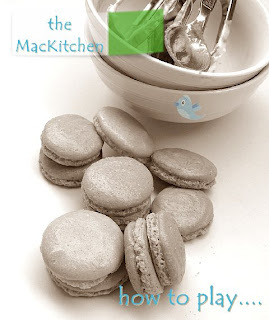 with helpers (hint, hint) create a 'Macaron Troubleshooting Guide' with pictures. The guide would show all the ways to fail at macarons along with the potential cause(s) of each the failure so that as new people learn to make them, they can figure out how to adjust based on results.